FREMANTLE recruit Tanner Smith has made his name as a tall defender, but the North Ballarat teenager could be the young key forward his new club is searching for. Smith, who was snared with pick No.36 in the 2012 NAB AFL Draft, was the only key position player drafted by Fremantle last Thursday. The club now faces a decision on where to develop the impressive 196cm key position player, with replacements needed for champion forward Matthew Pavlich and All Australian defender Luke McPharlin in the coming years. Smith boasts elite endurance, speed and agility, running a personal best 3km time trial in 10min 18secs, which would place him among the leading runners at Fremantle, and a 15.3 beep test. The former member of the AIS-AFL Academy prefers to play as a key defender but Fremantle is open to throwing him forward where his endurance would be a strong asset. "I think being a 196cm player, that [endurance] is definitely a positive," Smith said on Monday as Fremantle's new recruits were unveiled at the club. "It's hard to find for a tall player like myself and hopefully I can use that against opponents. "As a junior I was more of a tall player for my age, so I played a little bit in the ruck and at centre half-forward as well. "This year I played a little bit more forward at the end of the year, but I've played most of my footy as a key back." Smith, who is originally from Horsham in regional Victoria, boarded at St Patrick's College in North Ballarat from mid-2011 and said moving interstate was "not an issue". Fremantle's other two recruits, Josh Simpson (No.17) and Max Duffy (No.39), were snared locally from WAFL club East Fremantle. Duffy, who looks up to Geelong Norm Smith medallist Steve Johnson, was overlooked for two years before kicking 33 goals in 15 games with the Sharks this year. The 19-year-old said spending two years in the workforce helped him mature and understand what life would be like without football. "I was a tree lopper for the last year and a bit, so this morning I would have been up pretty early cutting down trees," the dangerous half-forward said. "I had a really good boss and he really helped me in maturing and coming along as a person. "Having missed [the draft] last year I probably needed a bit of work done. "It was really good to get out in the work force and see what it would be like. And I actually didn't mind chopping down trees." Duffy was a member of the AIS-AFL Academy in 2010, but basketball was his first passion and a sport he was initially set on pursuing. 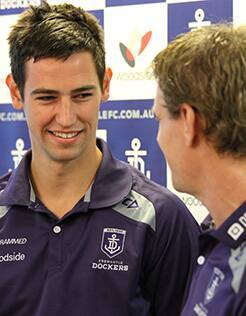 "I played state 16s basketball and I was involved as a bottom-ager in the under-18s," Duffy explained. "I guess I've got to thank [former Perth Wildcats basketballer] Mike Ellis for cutting me … because I never would have taken up footy too seriously. "I was in some development squads for football at that stage but I was probably looking more towards basketball and seeing how I would go in that. "I was obviously cut from the squad and it kind of forced my hand."